Economic growth speeds up and slows down. Oil prices rise and fall. Greece passes in and out of crisis. But the U.S. job market just keeps going. U.S. employers added 223,000 jobs in June, the Bureau of Labor Statistics said in its monthly report Thursday. The unemployment rate fell to 5.3 percent, the lowest it’s been since the spring of 2008, when the recession was just beginning. Thursday’s report was far from unambiguously positive, however. It may even have been disappointing. The government revised down its estimate of prior months’ hiring by a combined 60,000 jobs. The labor force actually shrank last month as job seekers quit looking for work. Wages were stagnant. But it’s important to keep that disappointment in context. The U.S. has now added jobs for 57 consecutive months, a streak that is unprecedented since World War II. 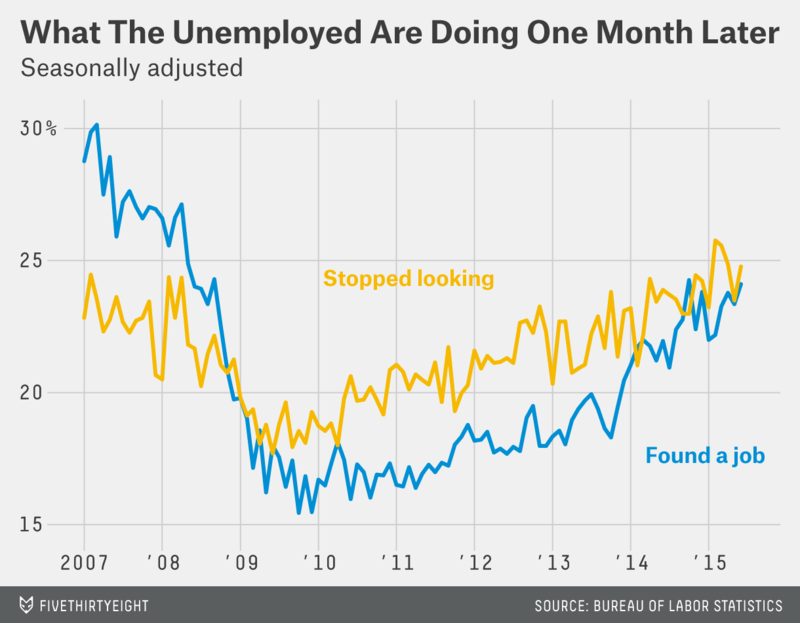 It has now been three years since the U.S. had a definitively bad month for job growth. (Several months looked bad at first but were subsequently revised up.) Since June 2012, the U.S. has averaged 220,000 new jobs per month, for a combined gain of nearly 8 million jobs. Those concerns have long since faded. Now many economists argue the job market is fully healed and that it’s time for the Federal Reserve to start raising interest rates to head off inflation. Last month, I argued anemic wage growth, among other evidence, suggests the job market still has further room for improvement. Thursday’s report suggests it still does. 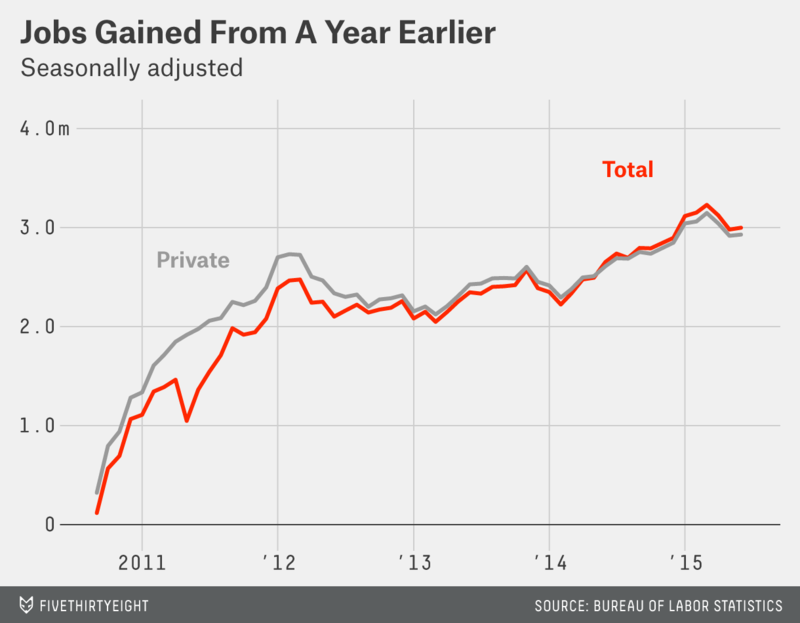 But there is no question that U.S. employment has been on a remarkable run for the past four years. Revisions hurt the trend: The monthly job figures are volatile, so it’s always wise to pay more attention to the longer-term trend. That trend has flattened out in recent months, in part because of downward revisions to April and May job numbers. It’s too soon to draw much of a conclusion from the pattern, but so far 2015 doesn’t look likely to repeat 2014’s exceptional growth. Weak household survey: Don’t be too quick to celebrate the drop in the unemployment rate. The government only counts people as unemployed if they are actively searching for work, which means the rate can fall either for good reasons (because people found jobs) or for bad ones (because people stopped looking for work). In June, the unemployment rate fell for bad reasons. More unemployed workers stopped looking for jobs than found work last month, and fewer people re-entered the labor force to look for work. The labor force participation rate — the share of the population that’s either working or actively looking for work — fell to the lowest level since the late 1970s. The decline is partly demographic, as the baby-boom generation continues to retire. But many economists had expected the strengthening economy to help counteract that trend by bringing more people into the labor force; so far, that hasn’t happened. No acceleration in wages: The average worker earned $24.95 an hour in June, exactly the same amount as in May. 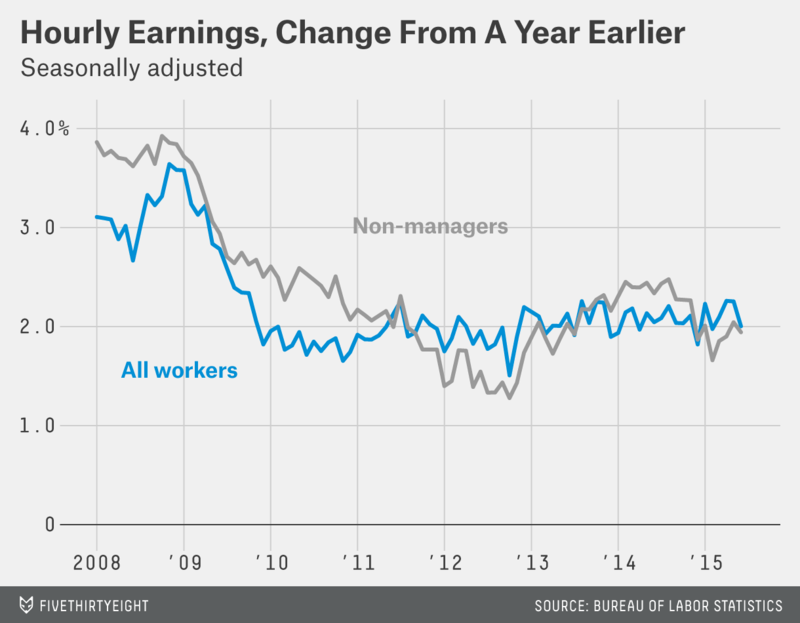 Month-to-month wage data is too volatile to be of much use, but the longer-run trend is clear: Hourly earnings are growing at about 2 percent a year, with no sign of acceleration. Nor did companies ask employees to work more hours: The average workweek was 34.5 hours for the fourth month in a row. The good news for workers is that 2 percent growth is faster than the rate of inflation, so inflation-adjusted wages are rising. But there is little sign that the improving job market is forcing companies to offer more significant raises to attract or retain workers. Strong consumers: Recent data has suggested that consumers are spending more money and becoming more confident. Thursday’s jobs data suggests the strong consumer economy is showing up in hiring, too. Retailers added nearly 33,000 jobs in June, and restaurants added nearly 30,000. Meanwhile, the health care sector continued to hire at a breakneck pace, adding 40,000 jobs. But manufacturing employment — a key source of middle-class jobs — was nearly flat in June, and the oil and gas sector continued to cut jobs. Fewer people are stuck in part-time jobs: June looked likely to be the month that full-time employment finally returned to its prerecession peak. That didn’t happen: Full-time employment actually ticked down in June, although the monthly data is volatile. Nearly all the growth in the recovery has been in full-time employment (which the government defines as at least 35 hours per week), but the growth has yet to offset the huge declines seen during the recession. 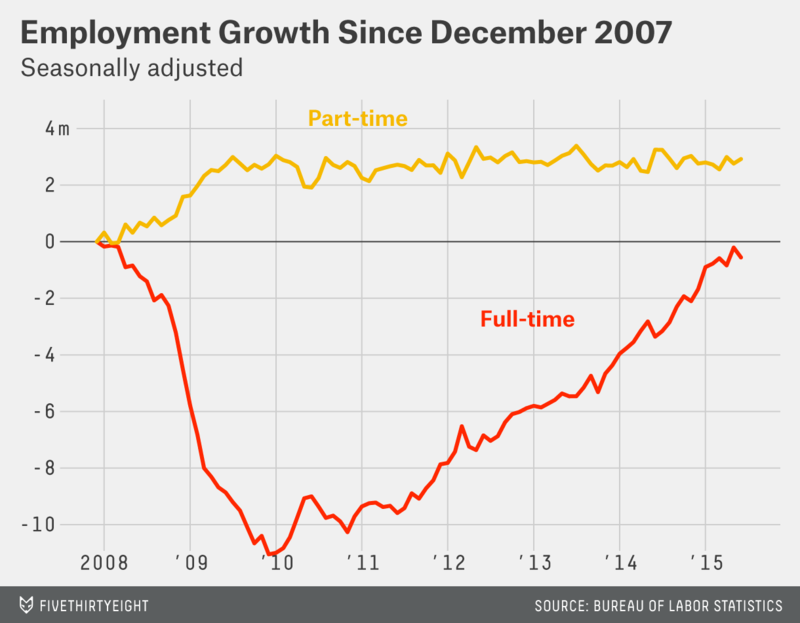 The good news is that fewer of the people working part time are doing so involuntarily. 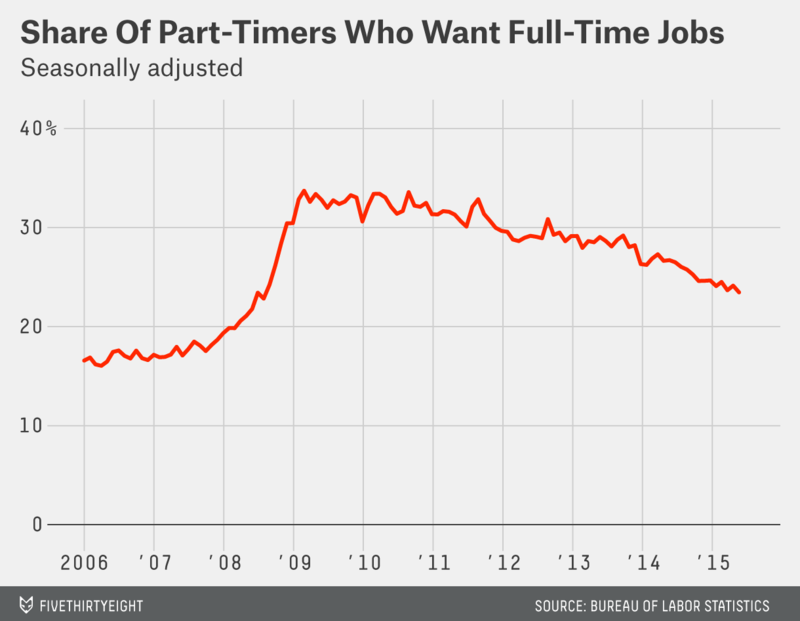 Less than 24 percent of part-timers say they want full-time work, the lowest share of the recovery. Dean Baker of the Center for Economic and Policy Research, a liberal think tank, has argued the rise in voluntary part-time employment could be due to the Affordable Care Act, which makes it easier for part-time workers to get health insurance. It’s hard to know whether that’s what’s behind the trend, but it’s clear that for whatever reason, more people working part time are doing so by choice. CORRECTION (July 2, 11:01 a.m.): An earlier version of this post misstated the number of years since the U.S. has had a definitively bad month for job growth. It has been three years, not four.